The Vasomedical model TS-3 was the second mainstream model EECP® device introduced by Vasomedical Inc. The TS-3 is known to be the most reliable device made by Vasomedical. Vasomedical sold more TS-3 model EECP Therapy devices than any other device. This system was introduced circa 2001 with abundance technological advancements of its predecessor the MC-2. We rate the TS-3 as the standard footprint for the industry. 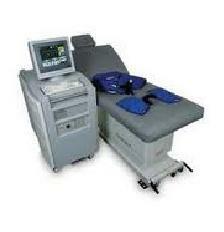 The TS-3 was considerably more comfortable for patients than the earlier model EECP device the MC-2. This unit brought improved patient comfort with a softer mattress and most importantly, the TS-3 removed the “slamming” effect for patients. Vasomedical is known for having comfortable cuffs that deliver a good squeeze. The TS-3 is still (to this day) one of the quietest units made. Arguably the most reliable unit ever made by any company in the industry. The TS-3 has service available from the manufacturer Vasomedical but the cost of service is at a premium. Like the MC-2, the TS-3 was expensive in the early years, but can now be purchase used from the manufacturer at a discount price. We see them used for $12,000-$20,000 online for a used machine depending on condition & hours of usage. Are you looking to BUY or SELL an ECP or EECP Device? Our Network of Buyers & Sellers is the largest in the industry.